Today we head to the Bond 23 press conference which has to be the most anticipated that I’ve ever been to. At the press conference, we’re hoping to officially find out the title of the movie officially (which we think will be Skyfall). According to the info we have, the press conference will be attended by Producers Michael G. Wilson, Barbara Broccoli, Director Sam Mendes, Daniel Craig and other key members of the cast. We’re hoping that if technology allows, to live blog the entire press conference so keep your eyes peeled below for updates as they happen. Who knows what will happen but we know it will be very exciting! The press conference is due to begin at 11.45 so keep your eyes peeled for updates below. You won’t need to click refresh, text should appear magically! UPDATE: See a round-up of all the highlights in Jon’s post here. We’ll be blogging it all live right here for you so stay tuned! Room’s pretty full now. 25 mins to go until kick off. Will it be called Skyfall? How many press people are there? Loads of speculation here about the title. We think it’s still going to be Skyfall but hopefully we’ll soon find out! Bond music has just started playing. Oh the excitement! So, Skyfall is the title, what do we think of it? Sam Mendes has been a fan as a child. First movie he saw was Live and Let Die. When he saw Craig play Bond in Casino Royale, he wanted to be a part of it and wanted the huge challenge. He has also confirmed that there WILL be action! Sorry for the spelling mistakes BTW. Trying to keep up! And Bérénice Marlohe says that she has too been watching them since she was a child. When she got the part, it took her days to realise that it was true! Now onto the audience questions…..
Q: After playing role in the dragon tattoo – how would you compare the two roles? Craig – “they are completely different”! Lovely! Question – What about the Scotish element to the film? They’re not giving anything away!! Q from Empire: Who’s going to do the bond theme? 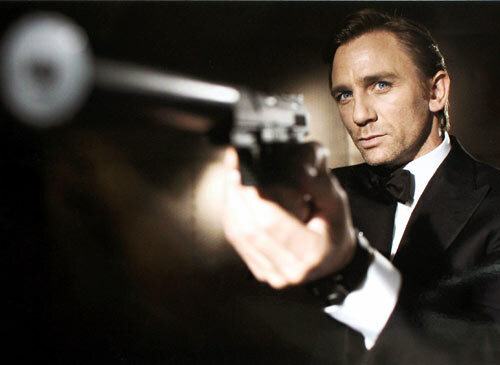 Q: Daniel – 3rd Bond movie, what will you try to bring to the Bond Character? Mendes also stated it’s hard doing a press conference when they cannot give anything away. Q: Question for Javier – How do you feel being in the beginning of the film and being the bad guy in the story? Javier – Being a baddie means soewhere someone thinks I’m a good guy! Q: Javier – You played such a formidable bad guy in a last film, how can this be improved? Q from the BBC for Sam – There’s an outstanding cast with 16 Oscar noms and your films alone with 12 Oscars and 6 wins. Think this might get an Oscar? A: Michael – We have a documentary currently being made. We have a lot of other things planned but as yet won’t annuonce them. Sony and ourselves are looking for a way for the fans to celebrate. Question from TotalFilm – Daniel, have you had to do any new training and new cast, what training have you done? A: Javier – Learning the English vowels!! *Audience laughs! Question from Deadline – If this goes well, will you direct a second? Q – What does Skyfall mean? Q: Will we see Quantum again in this movie? Question from Sky – Producers, were you worried this wouldn’t get made after the problems with MGM? Q: Was there every any reason to make the movies more high-brow? A: Barbara – Damn Right!! Michael – We want to see more than that! Question – Daniel – is it hard to not be typecast as Bond? A: I just like working. If i could do this for a few more years then I’ll be happy. Ben Moritimer who is writing for Coming Soon asked a great question – They wont tell us the names of three characters, is that because Bond Fans will recoginise them? Praised on a well pharsed question and they implied that is exactly why but i guess we’ll see! And that is that people. End of the press conference. We’ll get this typed up with the highlights and stay tuned. thanks so much for everyone who joined us and don’t forget Bond 23 is Skyfall and starts shooting today – my guess is at the legendary Pinewood Studios. This is Dave signing off!